: Sheepdog used in the farms and pastures of the Pyrenees. : Revised by Jennifer Mulholland in collaboration with Raymond Triquet. : Coming from humble beginnings, it was practically unknown to the official dog scene until the early 20th century. Its type varies considerably from one valley to the next, its shape, its coat can be very different, but its character and behaviour never vary. The first official standard was drawn up between 1921 and 1925 by Mr. Bernard Sénac-Lagrange. It was first modified under his presidency and then under those of Messrs. Charles Duconte (1954-1986), Guy Mansencal (1986-2000) and Alain Pécoult (since 2000-…) in close collaboration with Raymond Triquet since 2001.
: Dog displaying a maximum of nervous energy in a minimum of size and weight. An ever alert physiognomy, a knowing air combined with great liveliness of movement give this dog a characteristic appearance unlike any other. Muzzle is shorter than skull in ratio muzzle 2, skull 3. Distance from elbow to ground is greater than half height at withers. : It is a courageous, resourceful little dog, showing initiative ant totally devoted to its master. It is headstrong by nature and firm control is usually needed to channel its energy and bring out the best of its intelligence liveliness. It is often wary of strangers. : Moderately developed, almost flat, with a scarcely noticeable central furrow, harmoniously rounded on the sides, showing a very slight occipital protuberance. Approximately as long as it is wide. Front section slopes gently to the muzzle. : Straight, a little shorter than the skull, tapering like a wedge but without a pointed tip. : Not very thick, covering the lower jaw completely and showing no apparent corners. Edges and palate are black or heavily marked with black. : Complete dentition. Strong canines. Scissor bite (upper incisors covering lower incisors without loss of contact). Pincer bite (edge to edge) is tolerated. : Expressive, slightly almond-shaped and dark brown. Neither protruding nor sunken. Wall eyes are accepted in dogs having blue with black mottling (harlequin or slate grey) coats of which they are almost always a characteristic. : They must be rather short, moderately broad at the base and not set too close to each other at the top of the skull, but not set too far apart either. They are triangular, fine and ending in a point; dropped, flat and very mobile. When alert, seen from the front, the top edge notably prolongs the transversal line of the skull. They may also be half-pricked; in which case the lower part must be pricked and mobile, and ideally the top third or half of the ear should fall forward to the front or the side, symmetrically for both ears. : Rather long and muscled, springing well up from shoulders. : The bone structure is strong without heaviness, muscle is lean. : Rather long and strong. : Short, slightly arched, but seems more so because coat is often thicker on hindquarters and croup. : Fairly short and rather oblique. : Well fringed, not very long, set rather low and with a hooked tip. When the dog is alert, the tail should, in general, hardly rise above the topline, however it may curve forward. In countries where this practice is not forbidden by law, some dogs are docked. A rudimentary tail is permitted. : Upright, lean, sinewy, well-fringed. : Rather long, moderately oblique. : Oblique and moderately long. : Pasterns (Metacarpus): Slightly oblique seen from the side. : Lean, fairly flat, of a definite oval shape. Dark pads. Small hard nails covered by hair which is also found under the foot, between the pads. : Rather closed angulation. Semi-long coated dogs have no fringing on limbs. : Not very long, moderately oblique, strong, well-defined muscle. : Well-angulated and parallel to the body. : Rather long and oblique. : Lean, set low, well angulated, hocks are sometimes a little close. : Perpendicular to the ground or very slightly oblique from back to front. Single or double dewclaws are acceptable on hind legs as is their absence. : Walking, the Pyrenean Sheepdog has a rather short stride. 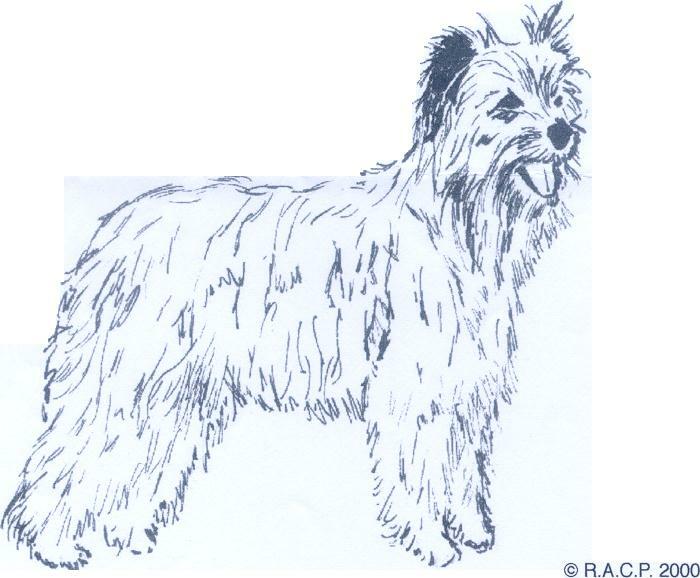 The trot, preferred pace of the Pyrenean Sheepdog should be free and vigorous. At a gentle trot, the head is carried fairly high, when the speed increases, the head is in line with the back. The feet are never raised high, the movement is flowing, the dog skims over the ground. : Thin, often marbled with dark patches, irrespective of coat-colour. Long, or semi-long, but always dense, almost flat or slightly wavy, thicker and woollier on the croup and thighs, texture somewhere between goat’s hair and sheep’s wool. In some dogs the mixture of coarse and woolly hair can produce sorts of strands or cords called “cadenettes" and sometimes matted or felted hair called “matelotes” which overlap like tiles on the croup. “Cadenettes” can be found on the chest and the forelegs at elbow level. The muzzle has shorter, less dense hair. Fawn, lighter or darker, overlaid with black or not and sometimes with a little white on the chest and on the limbs; grey, lighter or darker, often with some white on the head, chest and limbs; blue with black mottling (harlequin or slate blue). Males from 42 cm to 48 cm. Females from 40 cm to 46 cm. General appearance: Heavy dog, not very active. Head: Ogival skull, rounded forehead, stop too much pronounced or non existent. Muzzle: Square or rectangular, lack of pigmentation on nose or lips. Eyes: Light or of wild expression. Lack of pigmentation on the eyerims. Tail: Tail curled on or over the loin; “squirrel tail” (carried horizontally over the back); fused vertebrae. Coat: Too abundant on the head, especially when it covers the eyes and on the muzzle when it looks like a griffon’s moustache. Poor texture, soft, wiry, curly or frizzy. Coat lacking density or thickness. Colour: White covering more than one third of the coat. Harlequin coat lacking contrast between grey and black or having fawn glints. Very diluted coat colour. Black coat with tan on head and on limbs (black marked with fawn). Nose and eyelids: Any colour other than perfectly black. Jaws: Over or under-shot, or any malformation of the jaws. Absence of more than 2 teeth (except PM 1). The presence of canines and carnassial teeth (PM4 upper jaw & M1 lower jaw) is obligatory. Eyes: Wall-eyes for any dogs other than blue with black mottling (harlequin or slate-grey). Flesh colour on the eye-rims. Light yellow eyes. Colour: White or colour not stipulated in standard; white covering more than 1/3 of coat in black dogs.